The time is rapidly approaching for Baku Summer Jazz Days. New jazz project, organized by the producer agency Premier Art Management jointly with the Ministry of Culture and Tourism, will be presented at the International Mugham Center on June 4-8. Five concerts with musicians from different countries will be held as part of the project. Ahead of the long- awaited music festival, Trend Life presents an interview with guests from Hungary. The organizers of the festival - Premier Art management addressed questions to one of the project managers, percussionist and drummer Andras Des. Question: Is this your first visit to Baku? What are your expectations? Answer: I already visited Baku two years ago, but it was a very short visit. I hope that this time I will have a chance to get to know this wonderful city better. Q.: Do you plan to perform new songs during the concert? A.: We'll present listeners our recent project "Maiden Tower". This album was recorded in the summer of 2016 and was released last year. Q.: How do you work with our jazzman Elchin Shirinov, we assume that you are familiar with our jazz heritage? A.: Unfortunately, I did not have an opportunity to get acquainted with the Azerbaijani jazz heritage, but I already met good jazz performers from Baku. I spent an unforgettable evening at a wonderful jazz club on my last visit. Q.: How did your work with Elchin Shirinov start? A.: We met in Budapest, when we played together in a group of famous Polish jazz performer Grzegorz Karnas. We also met several times at Voicingers festival. 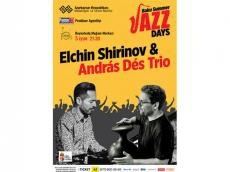 Q.: Whose idea was the creation of the project Elchin Shirinov & Trio András Dés? A.: It happened all by itself, when we first met Elchin. We felt that we definitely need to work together. Then a concert was organized in Budapest and we realized how delightful this band sounds. And so we ended up in the studio. Q.: We are looking forward to the premiere, do you share these emotions with us? A.: I am very glad that I can perform this in Baku, the main attraction of which is the historical Maiden Tower, which gave the name to our project. And here is what national pianist Elchin Shirinov said about working with Hungarian friends. Question: Elchin, first of all, we congratulate you on your great creative success. It became known that one of the first-class jazz musicians of our time Avishai Cohen - composer, double bassist invited you to his band, with which you will touring around the world. How did you take this news? Answer: This was always my cherished dream. For 15 years I have been listening to Avishai Cohen and I love his music, his play and his arrangements. At first my manager wrote to me, and then he called me and said that he liked my game, my compositions, improvisations. And he said: "Please do not change the way you perform." To hear this from the giant of jazz costs a lot! I'm very happy. At the invitation of Avishai I flew to Israel, where we rehearsed with him for several days, after which our first performance took place in France, near Paris. For me it was a great pleasure to share the scene with such a master. And after the concert, Avishai officially announced that I will play in his group - in the trio and in the symphony project. Q.: Last summer we showed your teamwork with foreign jazzmen - bass guitarist Linley Marthe (France) and drummer Stephane Galland (Belgium). And then again an international project, this time with Hungarian musicians. We know that you and Andras Des are co-authors of the project. How was this accomplished? A.: Concert last summer with Linley and Stephan ! Such great musicians! It was unforgettable! We met Andráš in Budapest when we played together with the famous Polish jazz vocalist Grzegorz Karnas in the Opus Jazz Club. After that, we played several times together in Poland at a jazz festival. And we realized that we perfectly feel each other and we really like to perform together. Then they decided to record the album. What happened, you will hear at the Baku premiere. Q.: You have a lot of tours, foreign performances. What are your future plans? A.: European Tour "Maiden Tower" and, of course, a world tour with Avishai Cohen are coming soon! Q.: We wish you success and, most importantly, good luck to your new project, which will premiere on June 5 at the International Mugham Center. A.: Thank you! We are looking forward to Baku Summer Jazz Days!